Every now and then we get some nice ‘oddities’ in the workshop. Some are for customer repair and others for sale second. This early Selmer MKVII features the 3rd octave key that is a rare option on some Selmer Saxophones. Take a look at the set-up below. It features an added vent hole and key on the neck. With the additional thumb lever near the left hand thumb rest. 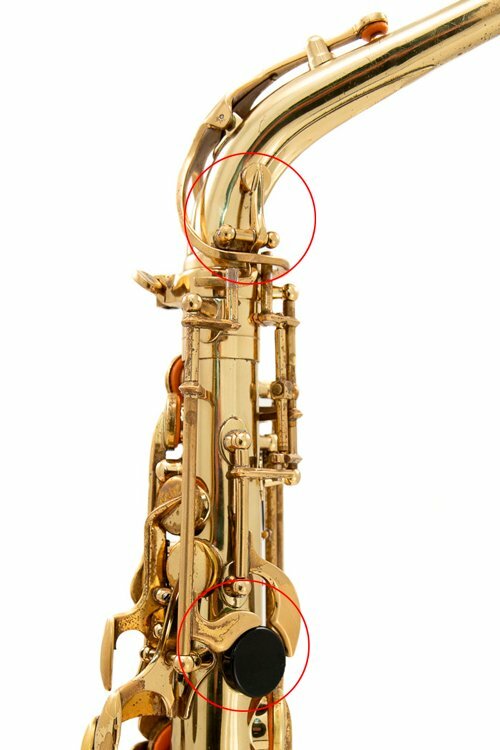 The idea is that by activating this key and venting it open, it alters the pitch and timbre of certain areas of the Saxophone. Selmer say that it helps achieve cleaner altissimo, specifically altissimo G. We know some players find it generally brings the pitch down a little in the very extreme high ends of the Sax. Also, some players use it to bring the pitch down of the left hand G#, A, Bb and B in the second register. Essentially all notes are affected by venting of certain holes and the positioning of those tone holes on the instrument. By it’s very nature any wind instrument is a series of compromises. There are examples of manufacturers trying to finesse beyond the accepted normal boundaries of instrument intonation. Where the hole is placed and the size of the hole, especially on the neck, will mean it affects certain groups of notes more than others. There are a set of nodal points down the neck which correspond to certain areas of pitch. 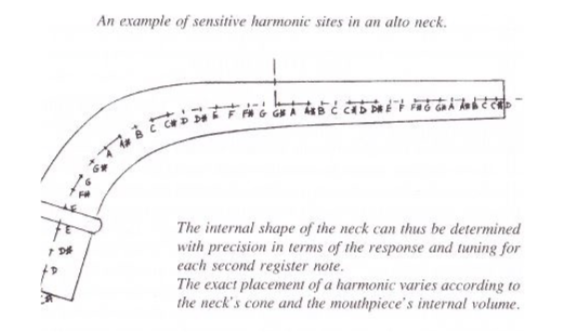 Adjustment of the surface area in these points will affect the intonation specifically. The principles behind this modification are solid, but of course the issue is that we all have different physiologies and as such, depending on how we use our oral cavity, we are ourselves an extension to the bore size and shape at the top of the instrument. Also, mouthpieces can vary in chamber size and shape, and all of this will have its own affect on intonation.